A must have Hellboy prose Anthology! Sixteen of the biggest names in weird literature pay tribute to Hellboy and the characters of Mike Mignolas award-winning books! Assembled by Joe Golem and Baltimore cowriter Christopher Golden and featuring illustrations by Mignola and Chris Priestley, the anthology boasts original stories by the best in horror, fantasy, and science fiction, including Seanan McGuire (October Daye series), Chelsea Cain (Heartsick), Jonathan Maberry (Joe Ledger series), and more! The new writer of Hellboy and the B.P.R.D., iZombie cocreator Chris Roberson, pitches in as well, and Chris Priestley (Tales of Terror) provides a story and an illustration! 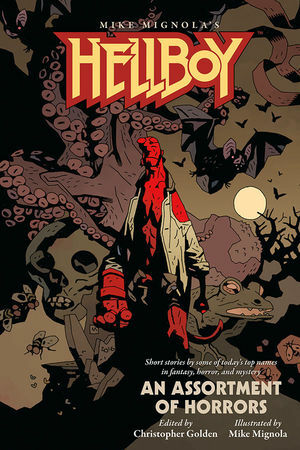 * Each story illustrated by Mike Mignola!